Title: Merkwürdige Reisen durch Niedersachsen Holland und Engelland (Ulm, 1753). Originally published in German, an English Translation, (minus the relevant plate), was published in 1934 under the title London in 1710. About: During his travels, von Uffenbach visited Flamsteed at the Observatory on 12 June 1710. His account of this visit (pp. 445–451), includes a detailed description (with plate) of a quadrant housed in the Quadrant House (or possibly the Sextant House). Given the date of his visit, the instrument is most likely to have been Flamsteed’s Mural Arc, the only other instrument in the vicinity being Flamsteed’s 7-foot Equatorial Sextant. However, the published plate bears little resemblance to the view of the Mural Arc that was published in Flamsteed’s Historia Coelestis Britannica, (London, 1725). Nor does it resemble the plate of the Equatorial Sextant (engraved by Francis Place after Robert Thacker c.1676) that was also included in Flamsteed's Historia Coelestis Britannica. Nor does it resemble the Francis Place engraving of Hooke’s 10-foot Mural Quadrant, an earlier instrument that had long since abandoned by Flamsteed and almost certainly disposed of. Allan Chapman and Derek Howse (both leading authorities), believe the instrument described and illustrated to be Flamsteed’s Mural Arc. GREENWICH – six English miles. It was very pleasant to journey down the Thames and the time passed mighty quick, because we were on the ebb tide. When we came to the bridge, we got out for a little and went on foot to the end of the bridge and let the boatman pass through alone, for the current there is so strong that small boats often capsize. On the other side of the bridge we got into the boat again. When we came to Greenwich we first looked at the wonderful Hospital for mariners and sailors, which is much more elegantly and magnificently planned than the Chelsey Hospital. They have now been at work on it for fourteen years, but it is only half finished. No royal palace can be more sumptuous. It costs prodigious sums of money, so that each sailor has sixpence deducted every month from his pay to be spent on the building. The great Hall, which was nearly finished, is so magnificent that it cost a thousand pounds to paint the ceiling alone. This Hall is a hundred and seven feet long, fifty-one feet six inches broad and twenty-four feet high. It has been built by ‘Mr. James Tornhill at St. Paul’s Church’. On the one side of the whole building which was entirely finished, we counted on the outside alone twenty-five pairs of columns, which are all very high, strong and elegant. But it is not so easy to describe this building as to see it in the engravings there are of it. The above-mentioned Hall will in the future be used as a dining-­room. There is another already finished where the seamen come together to smoke their pipes, in which, moreover, there are fires burning. Next the building is an exceedingly pleasant park or zoo­logical garden, where there are many deer which are un­commonly tame. I believe that there cannot be a more charming spot in the world than this park, for in it there is a high hill with very fine trees. When one climbs it, one has not only a view of the Thames for a great distance but of London on the opposite bank and on the other of wide stretches of country. On the top of this hill Mr. John Flam­steed, the illustrious Astronomer Royal, has his residence and observatory. He could find nowhere in the world a more convenient and pleasant situation. We waited on him, and he had us shown into his Museum, since he was quite crippled with gout. He received us with uncommon civility (which is in England most unusual). For an Englishman he spoke fairly good and fluent Latin, and he did not pronounce it with too much of an English accent, so that we could understand each other quite well. He was also well acquainted with our German mathematicians, such as Sturm, Weigel, Bernouilli, and he spoke of them with much pleasure, asking us questions about them. After we had conversed for some time, he showed us a prodigious quantity of his written ob­servations which he has been making for the last thirty years, especially for the benefit of navigation. He has published very little under his name with the exception of some ‘obser­vationes’ in the ‘Transactionibus’ of the Society in London. He certainly has a pension, but this, as he told us himself, is so small that, if he were not the son of a rich merchant, he would not have been able to accomplish much. He is, more­over, of a weakly constitution, and is an ugly little fellow of about sixty years of age, but his industry is untiring. Among other things he showed us how he had entirely disproved Bayer and his constellation or ‘Asterismos’, and he lamented that neither Bayer nor others had rightly understood the Ptolomaeum. He has shown great zeal in emending and restoring the Ptolomaeum. I will only give you one example which occurs to me. He pointed out to us that Sagittarius must be holding his bow in his left hand and drawing it with his right, with his face turned forwards, which is entirely contrary to the views of Bayer and all other Astronomers. He also pointed out to us that innumerable fixed stars had been marked quite incorrectly. When I said to him it was a pity that he did not edit the Ptolomaeum, he answered me that now that Prince George was dead, there was scarcely any hope of this. The latter had been well disposed both to him and to his science. It appears, moreover, that the love of the mathematical and physical sciences which for some time had been very great in England had almost entirely cooled off, and that among men of fashion in London it had de­clined and almost died out. Mr. Flamsteed further pointed out to us several other astronomical phenomena, in especial eclipses of the sun in the coming years. In particular he said that in the year 1715 on the 22 April there would be a quite unprecedented eclipse; in fact, as he assured us: ‘totus Sol obscurabitur,’ the whole sun would be darkened. After we had conversed for a while, we begged that we might be shown his ‘observa­torium’, to which he readily agreed. He sent with us his ‘amanuensem’, who showed us everything. It was far more wretched both as regards comfort and equipment than we had imagined. First he took us into the room to which Benthem refers in the Engelländischer Kirchen - und Schu­len-Staat. This is of only moderate size and contains noth­ing but a fairly large quadrant and the clock, which Benthem also mentions, as well as the lines inscribed round it begin­ning, ‘Hunc si respicies, etc. He did not mention the follow­ing inscription, which is much more notable: ‘Sr. Jonas More caused this movement with great care to be thus made Ao. 1676 by Tho. Tampion. Motus annus.’ Below follow the lines quoted by Benthem: ‘Hunc si respicies’, etc. In other respects the clock is good. Leading out of the room is a small paved open vestibule or balcony, from which Mr. Flamsteed makes his observations. On either side are two ‘camerae obscurae’, which are here uncommonly pleasant on account of the charming prospect and the great traffic on the Thames. We had an excellent view because it was fair, clear weather, so that there was no coal-smoke or fog in the air. Below us was a little house in which stood a very great quadrant of peculiar ingenuity. Because it is so convenient and out of the ordinary a sketch of it is given in Fig. XLI. It is in no wise different from such quadrants as one usually sees except in the telescope and its fastening. A wide brass bar descends from the central point of the quadrant over the circumference A, and the telescope is fastened to it by means of two rings; the ‘oculare’ and the ‘objectivum’ have their own special mounting, (Fig. h), so that they do not hang from the central tube; and this was formed of tin in cylindrical shape and fastened by means of its own rings between the two glasses, so that it could be taken out and replaced. 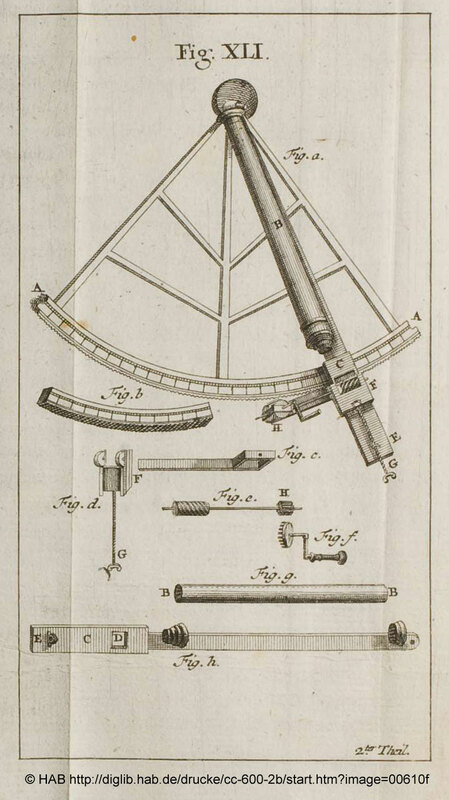 An inch from the ‘oculari’, between this and the ‘objectivo’, two black silk threads had been stretched across each other inside the telescope, so that their point of intersection corresponded exactly with the centre of the glasses; in this way the times of transit of the stars under observation could be noted with accuracy. The bar on which the telescope rests was so wide and so long that it extended beyond the circumference A of the quadrant without touching anything; and it had, more­over, a broad heel-fitting (vid. Fig. h) which projected so much that it was as thick as the circumference A, in order that this part C might extend beyond it and the degrees marked on it be graduated. Above the part of the heel-­fitting which passes over the quadrant, inclining towards the ground, was a square hole, D (in Fig. h), which has been pierced in order that the endless screw which will be de­scribed below could move up and down in it. Nearer the end of the heel-fitting was an upright nut, E, with which the machine F could be screwed up and down after turning screw G within it, which was fastened by one end to the machine F in such a way that it could be turned easily with­out coming unfastened. The machine F (vid. Fig. d) is so adjusted to both the near sides that it fits over the end of the bar and can be moved up and down it. Fig. c is fastened to this machine F and not separated from it, as it is to be seen here in c and d, so that it slides up and down with the machine F (Fig. d). In the hole to be found in the machine F I have mentioned so often is an endless screw, which with its shaft moves towards the cog-wheels, H, and is turned by the crown-wheel that meshes with them. Every part depends on this endless screw, for by its rotation it sets the telescope in motion with such complete isochronism that not a moment must be lost in making observations. Fig. e shows the end­less screw with its shaft, and the spring fixed to it with which the crown-wheel F meshes and, by means of its shaft, causes the movement; so that, when it is turned, the endless screw revolves with it and. meshes with the cogs that are to be found round the whole of the lower part of the quadrant, in such a way that the bar with the telescope is raised or low­ered. Fig. b shows how the lower part of the quadrant is formed and that it has purposely been made almost half as thick as it is broad, so that the screw might notch with greater ease. For this purpose also a segment of a circle passes upwards through the quadrant and into this the endless screw fits exactly. But if one wished to elevate or dip the tele­scope very abruptly, it would take too long with the endless screw, and the latter can be pulled out by the other screw, G, so that it no longer meshes with the cogs of the quadrant. Thus the bar and the telescope can be raised and lowered quickly, though afterwards the endless screw must be used to get it into the exact position for observing the stars. The part of the whole machine which is of primary importance and also the most difficult to get into working order is the indented half-screw, or the cogs in the circumference of the quadrant; this demands much trouble and skill, because it is only a segment of a circle and also moves in a curve with the circumference round the centre and requires much care and dexterity. When we had once more taken leave of Mr Flamsteed, we should have liked to look at the house below in the park, which now belongs to the Queen, and the elegant staircase that is in it; but the time was too short, and we had to hasten homewards with the intention of coming back another time, so that we should miss neither our dinner nor the turn of the tide on the Thames. We therefore again got into our boat and were rowed Londonwards with the tide; and we risked passing right through the centre of the bridge, where the eddy and the waves were so violent that, when we were under the arch, the water was piled up on either side of us to a much greater height than we in our little ship. Earlier in the day, when we had watched our boat passing through the bridge, from the shore we could see neither boat nor boat­man, so that one could well imagine that both were being sucked down by the water. We reached London at dinner time, that is after two o’clock, and in the afternoon we drove to the celebrated clockmaker’s, Buschmann.